DONALD Trump vowed to smash the Islamic State terror machine yesterday after calling on Muslim leaders to expose killers among them. The US Presidential hopeful claimed he would turn the full force of the American military against jihadists if he makes it to the White House. Mr Trump, front-runner for the Republican Party, also accused senior Islamic figures in Britain of “absolutely not reporting” hardliners. His comments in an interview with TV’s Piers Morgan followed the Brussels attack which claimed at least 31 victims and the arrest of Salah Abdeslam, suspected mastermind of the Paris atrocities.Abdeslam was able to stay hidden in a Muslim ghetto of Brussels for four months. 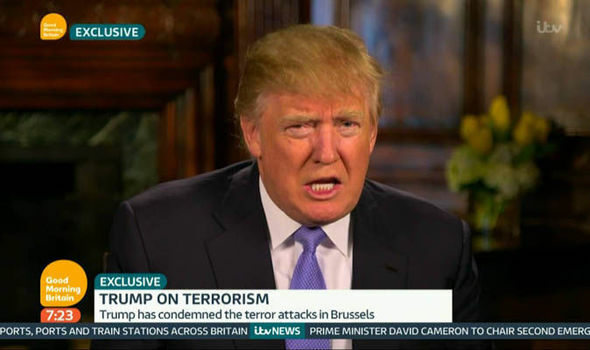 Mr Trump suggested terrorists from IS – also known as ISIS – may be given protection by Islamic communities in European cities. He told Mr Morgan, presenter of ITV’s Good Morning Britain: “I would hit ISIS so hard you wouldn’t believe it. “I would get the people over there to put up their soldiers because it’s about time that somebody did it. But I would have such back-up like you’ve never seen before in terms of air power, air strikes etc.” Urging Muslims to identify jihadists in their communities, he added: “They have to report the bad ones. If you report the bad ones, all of a sudden you are not going to have the problems.